The Department of Justice says it will look at Canada's extradition laws in light of the injustice suffered by Canadian professor Hassan Diab, who spent more than three years in solitary confinement in France on accusations that French judges now say appear to have been a case of mistaken identity. 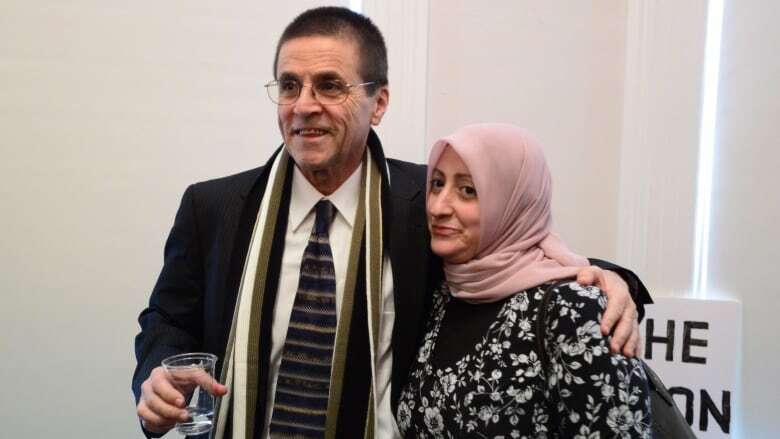 Upon his return to Canada, Hassan Diab could not have been clearer; he doesn't want "a penny" of compensation, "not even to buy a cup of coffee." Instead, the former university professor said, "my main mission for the time being is to help get rid of the existing — I call it lousy — extradition law." Wednesday the Liberal government hinted that changes to that law could be coming. "The minister of justice and attorney general of Canada always works to ensure that all federal laws are consistent with the Charter, the rule of law, and the highest standards of justice and fairness," said spokesman Dave Taylor in a written statement. "The minister is seeking guidance from her officials regarding the effectiveness of existing protections in the Extradition Act, and has asked them to look at any lessons learned in relation to this case." Few cases have so effectively raised questions about the act, which landed a Canadian in solitary confinement for years without enough evidence (as the French judges ruled) to justify holding a trial. Extradition is only supposed to happen when the foreign country in question is ready to take a Canadian to trial, said Diab's lawyer, Don Bayne. "And France, as we argued through every level of court in Canada, was never, ever ready with a case to try Dr. Diab." "The justice minister at the time of the parliamentary debates about the current Extradition Act, promised that no Canadian would ever languish in a foreign prison during a foreign investigation, yet that's exactly what our courts let happen to Dr. Diab." Diab's stay in France's Fleury-Mérogis prison, during which he missed the birth of his first son, came after an almost six-year fight against extradition in Canada. For some of that time, Diab had to wear a GPS ankle bracelet, and pay $2,000 a month for the privilege. A hundred supporters in Ottawa each volunteered $20 a month to help meet the expense. Bayne said the Extradition Act requires the accused to prove the information against them is "manifestly unreliable." The requesting state need only make allegations, and give assurances its case is valid. France, for example, was not required to provide sworn testimony against Diab. Some countries Canada extradites citizens to do not return the favour. "The prospects of conviction in the context of a fair trial seem unlikely," Maranger predicted. Yet under the law, Maranger merely "committed" Diab for extradition. Only the minister of justice could actually "surrender" him. That minister was Rob Nicholson. He was the only Canadian official with complete discretion and, upon reading Maranger's concerns, could have simply vetoed the extradition, yet chose not to. In a letter to Diab's lawyer justifying his reasons, Nicholson appeared to prioritize Canada's diplomatic relationship, giving France the benefit of the doubt despite Maranger's concerns. "Applying Canadian standards to France's legal process undermines the good faith and honour that underlies the extradition relationship between our two countries," he wrote. "While France's legal system differs from that which operates in Canada, I must assume, based on the principles of comity and good faith, that France will treat Mr Diab fairly, even if the evidentiary and procedural requirements under which he would be tried are at variance with our own." Nicholson's reply to Diab's lawyer said, "no assurances are warranted in this case." "As I stated previously, the principles of comity and respect for state sovereignty which are the cornerstone of the extradition process mandate that deference be shown to a treaty partner's criminal justice system, including their evidentiary requirements," Nicholson wrote. Nicholson's letter also dismissed the fact that Diab's passport did not show travel to France at the time of the bombing. The French, he pointed out, alleged that the bombers travelled on false passports, "thus making Mr Diab's 1980 passport corroborative of France's allegations against him." In other words, the lack of any evidence in Diab's passport showing he was in France, helped prove he had been there at the time. French judges ultimately determined that "consistent evidence" backed Diab's claim that he was in Lebanon sitting exams at the time of the bombing. "Extradition requests made to and from Canada are confidential, state to state communications. Canada's Extradition Act provides for Canada's court system to determine if there is sufficient evidence to justify an individual's committal for extradition." "This case, like all extradition cases, was subject to judicial review at several stages of the process. You will note that the Supreme Court of Canada refused to hear the appeal in this case." The statement does not address his role in the extradition.